A report released today by the Local Search Association and prepared by comScore, Inc. finds that local search via non-PC devices continues its significant pace of growth, driven by the rapid adoption of smartphones, tablets, and other mobile devices. The continuing shift of mobile usage signals an opportunity for local businesses to evaluate where they devote their online ad spending. 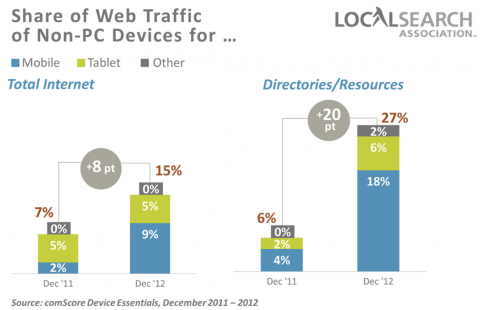 Traffic to online directories and other local resources from non-PC devices more than quadrupled in 2012, reaching 27 percent share of total web traffic in December 2012 from 6 percent share in December 2011. The percentage growth of page hits on online directories and other local resources from non-PC devices grew at more than double the 8 percent growth rate in total web traffic on non-PC devices in 2012. 48 percent of U.S. mobile users used their devices to access local content in December 2012, up from 42 percent inDecember 2011. When compared to all smartphone users, Internet Yellow Pages (IYP) app users are more attractive to advertisers based on their age, income, average monthly spending and typical exposure to ads. The Local Mobile Search report looks at the evolving mobile environment in the U.S. and the growing role of smartphones, tablets and other connected devices in the local search experience, highlighting trends in online directory and IYP usage and demographics. The report is based on December 2012 data from several comScore digital and mobile metrics databases. More than half of all IYP app users (53 percent) are age 25-44. IYP app users are 51 percent more likely to have an income greater than $100,000 versus all smartphone users. IYP app users are more prolific shoppers than average smartphone users. 41 percent of IYP users make at least one on-phone purchase per month, versus 19 percent of all smartphone users. IYP app users spend considerably more in on-phone purchases than all smartphone users, with 10 percent of IYP app users spending a monthly average of more than $500 on on-phone purchases, versus 4 percent of all smartphone users. Approximately 8 percent of smartphone users accessed IYP apps in the fourth quarter of 2012, while a larger portion – 12 percent of users – leveraged IYP mobile sites via their browser. "IYP mobile apps are a powerful tool for local businesses to reach ready-to-buy consumers," said Neg Norton , president of the Local Search Association. "As the market continues to evolve, IYP mobile apps represent an easy first-step for local businesses to expand their integrated advertising efforts into the mobile space." The report shows that rapid growth of connected devices is drastically changing how consumers access the Internet. In 2012, growth in the number of PC users accessing the Internet flat-lined for the first time. By contrast, the share of web traffic from non-PC devices including smartphones and tablets more than doubled to 15 percent in December 2012 versus 7 percent inDecember 2011. More than one in three (37.3 percent) of all U.S. smartphone users also owned other connected devices at the end of 2012, including tablets (28.8 percent), eReaders (10.0 percent) and other handhelds like portable gaming devices (4.1 percent), providing consumers with additional ways to access the Internet. "The media landscape continues to diversify as more consumers begin using smartphones, tablets and other connected devices in their daily lives," said Norton. "Local businesses should pursue mobile advertising strategies and introduce smartphone and tablet-friendly websites to reach consumers increasingly accessing the web from non-PC devices." Posted By Scott Brennan. Connect with him on Google+. Access Publishing, 806 9th Street #2D, Paso Robles, CA 93446, (805) 226-9890.